Quicklet are proud to present this superb semi detached property to the rental market. This home offers spacious family accommodation and benefits from an abundance of internal space allied to a superb rear garden. The property is located in the highly desirable seaside town of Bangor with its wide range of restaurants, leading schools, shops, cafes, bars and a stunning promenade and marina offering many leisurely walks. The convenient location also offers a straightforward commute to Belfast city centre. Internally this home comprises a welcoming reception hall, large airy living room with and feature fireplace, spacious dining room, a fully fitted kitchen with an excellent range of storage units, three well proportioned bedrooms and a newly installed, large bathroom. An added bonus is the fact that there is a recently constructed utility room to the rear. A large attached garage completes the property. 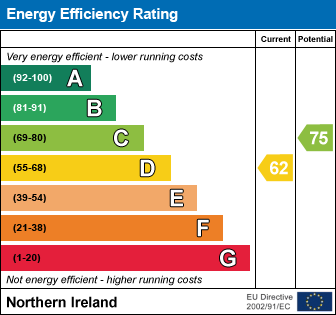 The home further benefits from uPVC double glazing and gas fired central heating throughout. Externally this home benefits from substantial gardens to the rear. The gardens have been well maintained and benefit from a lawn. There is a large driveway offering space for a car. This excellent property is located in a popular residential area close to many leading primary and secondary schools and offers a straight forward commute into Belfast city centre. We are positive this property will appeal to a wide range of tenants including couples or families and we advise early internal viewing to fully appreciate what this outstanding family home has to offer. Call Quicklet Property Management and Letting Agents Belfast office on 02890665167 to arrange a viewing.